It has been a while since my last meal recap, so there are a few more items here than I made in the past week. Spicy vegan white pizza with broccoli rabe and truffle cream. I was SO excited to make this, and it was great, just maybe not quite up to the standard of my dreams (which isn’t exactly fair anyways). I really wanted the flavor of the pepperoncini peppers to pop, but they got lost among the other ingredients. The truffle cream was an excellent creamy topping, and really worked well in place of cheese as protein and a binder. I will definitely make this again, just with 3 or 4 times as many peppers. Easy lentil soup with lemon zest, garlic, and parsley. The gremolata really takes this from a ho-hum brown lentil soup to one that is bright and vibrant. Next time I would even make more of the gremolata for very healthy dollops. Julia Turshen’s no-freakout fried chicken. There were so many things I liked about this recipe. It uses a whole chicken that you break down. There is smoked paprika in the marinade. And SPICY HONEY to drizzle on top. It truly did not freak me out, and was incredibly delicious. Chicken pot pie (The Homemade Kitchen) and roasted broccoli rabe with lemon. It has been a while since I made pot pie, and my first time making this recipe. It is chock full of vegetables, with a great binding sauce, and biscuits on top. I made it for a dinner party and the whole crowd was pleased. German potato salad (sans bacon, potatoes boiled not grilled), sauteed red cabbage, and beer brats. Is it possible to go wrong with this combination? I had the brat on a roll with a large swipe of beer mustard and some of the cabbage. Later in the weekend I heated up some of the potato salad and cabbage, then topped them with an egg for breakfast. Mushroom rice burgers (The Sprouted Kitchen) with lemon aioli, avocado, sauteed beet greens, and roasted sweet potatoes. These “burgers” have a long ingredient list, but great flavor. Since they have a lot of brown rice in them, I find them a bit too grainy when put on a bun. I had intended to serve them on a salad but forgot to buy a salad base, so they ended up going with a variety of vegetables in the fridge. It wasn’t the most elegantly composed dinner, but made great use of what I had around. Chickpeas in a fresh cilantro sauce, tomato, onion, and cucumber koshambari, and bhatura (Vegetarian India). The real showoff of this dinner was the bhatura, an Indian fried bread which I had never eaten more but will be seeking out more often. It was very similar to a pita, but fried instead of baked. The chickpeas did not take much to put together, just a simple sauce made in the food processor. Pizza with sauteed leeks, Italian sausage, kale, and peppadew peppers. This was a pizza born of random things in the fridge (and it was not my most delicate pie). I had about half a pound of Italian sausage that I cooked and removed from the pan. I sauteed the leeks in the sausage fat. I had some chopped kale that I put on top of the tomato sauce, followed by the rest of the ingredients and topped with shredded mozzarella. Curried lentils with coconut milk, roasted cauliflower with Indian spices, brown rice, and yogurt. I felt like I should have worked harder to make such a satisfying meal. These were so easy and flavorful. Paired with roasted cauliflower and topped with yogurt, this is one of my new favorite vegetarian meals. Other reading: The Hippies Have Won. I for one am very thankful that miso, tahini, and quinoa are mainstream ingredients now. Sticky rice with Chinese sausage. There is a Vietnamese grocery store with other Asian ingredients not too far from my house. When I was shopping for something completely different I came across some of this sausage, and decided to buy it and later figure out something to do with it. I then ended up buying sticky rice to make this recipe….but didn’t read how to cook it until it was time to do so. An overnight soak followed by a steam?! Nevermind. I made what is probably an unacceptable substitute (brown rice), but it got dinner on the table that day. Never having eaten this kind of sausage before or had this dish, I wasn’t quite sure how to judge it. The sausage was definitely sweet for my tastes. I made some stir-fried greens with chili oil on the side, but I ended up stirring everything together for the leftovers and found the spice and slightly bitter greens nicely balanced out the sweet sausage. Mama Chang’s Hot and Sour Soup. I made this a couple weeks ago, when it was soup weather. This recipe comes together so quickly but is exploding with flavor. I accidentally bought silken tofu, which the recipe specifically says not to use. Instead of adding in the tofu and then whisking in the scrambled egg, I added the egg and then stirred in the tofu and everything turned out fine. Ultimate spaghetti and meatbrawls with serious Sunday gravy (from In My Kitchen). This isn’t how I grew up eating meatballs. The sauce is prepared more like a bolognese, but leaving out the meat (because it is in the meatballs) which makes for a more broth-y sauce. The recipe called for an hour of reduction, but I probably would have given it at least two if I was willing to push dinner off that late. After reducing it further after dinner, then eating it again as leftovers I was sold on the broth/sauce. It turned into a complex sauce full of umami from the tomato and parmesan. Definitely worth making, but just give yourself some time. This would also be especially amazing with fresh pasta if you have the time. Ground pork and mushroom tacos with baked Spanish rice (from The Thug Kitchen Cookbook). I had some leftover mushrooms from the previous week’s hot and sour soup, plus ground pork leftover from the meatballs. I sauteed the pork to render the fat and break it up, and removed it from the pan when it was browned through. Then I cooked the minced mushrooms in a couple batches. When they were browned I added in some chopped chipotle en adobo, a few minced garlic cloves, cumin, salt, and the pork back to the pan. It made for a spicy and meaty taco filling rounded out nicely with some lime crema and cilantro. The rice was from Thug Kitchen, and was an easy baked dish. 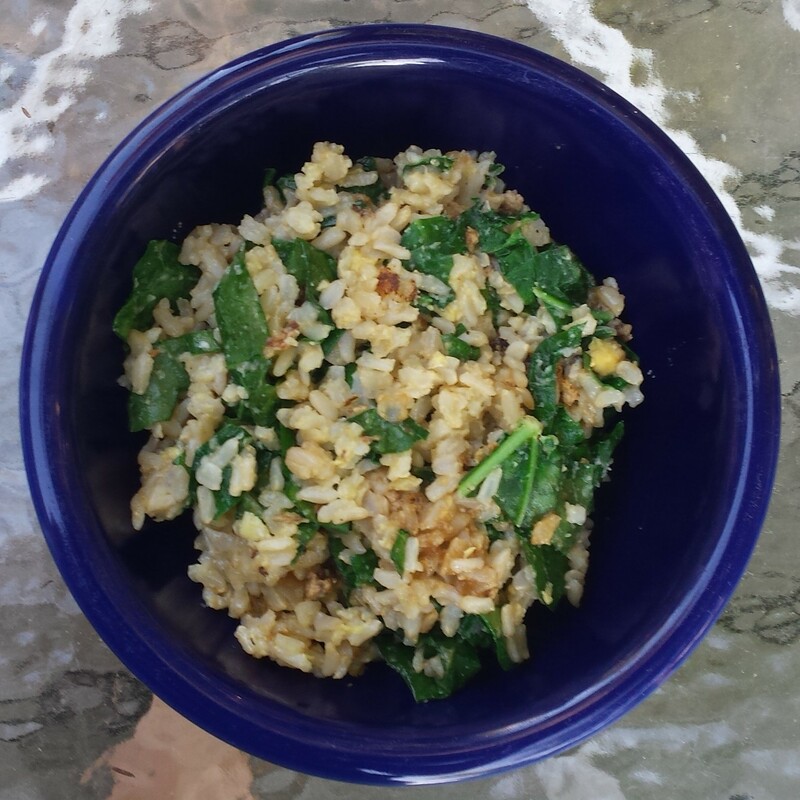 I’ve made similar versions before, but this one was especially good because it was made with brown rice and had just the right amount of liquid to cook the rice but not end up soggy. Smokey black-eyed peas with roasted sweet potatoes and collards (from The Thug Kitchen Cookbook). I need to learn that recipes which call for a whole sweet potato per person are just crazy. I made six servings of this and 4 potatoes would have been plenty. The real star here are the beans, which are cooked with chipotle en adobo, allspice, nutmeg, paprika, and garlic. It makes for an awesome stew to balance out the sweet potatoes. Green chile baked flautas (from The Thug Kitchen Cookbook). These check off all the right boxes for a tiring work week: fast, easy, healthy. You make a mashed bean filling with sauteed onion, a few spices, and corn (though I subbed sauteed kale), put it in a tortilla, roll it up, and bake it. After having made these a couple times now I think the filling would be better in a different format, because the tortillas don’t get super crisp or add much to the dish like this. New old-fashioned coffee cake (from Flour). I make this coffee cake about once every five years. It is dense, buttery, and just delightful. Maple oat scones (from Flour). I’ve made these before and loved them, but this time they turned out a bit dry. Did I not incorporate the butter enough at the beginning? Bake them for too long? Make them too small? They have great flavor and are not overly sweet so I will definitely try them out again. Lemon cremes with oat-thyme crumble (from The Sprouted Kitchen). I had some leftover silken tofu from the hot and sour soup and had always wanted to try this recipe. The creme comes together about as fast as it takes you to put everything in the food processor and whiz it. The crumble was a simple combo of oats, nuts, coconut oil, and sugar, that I would make again and again just as a granola. For a dessert that came together in about 3 minutes and then just needed to be served, it was quite pleasing. Hot and numbing wings and lo mein. I didn’t even watch the superbowl…but I will use any excuse to make chicken wings. These were crisp on the outside, and moist on the inside. I honestly would have liked them a bit spicier, but maybe my chili flakes are past their prime. The extra fridge space these need for a day is definitely worth not having to bring out the vat of frying oil. I’ve made this lo mein many times, and this go I used broccoli instead of cabbage. I find them slightly under-seasoned as the recipe is written, so I usually add a bit more soy sauce. Cheesy polenta with sauteed onions, kale, and beans. This was what I meant to make last week when I forgot to buy cornmeal. I used a mix of cheddar and mozzerella in the polenta because there were bits of both languishing in the fridge. I used some schmaltz to saute the onions (saved from the chicken wings), then added in the kale to wilt. When the kale was cooked I added a can of kidney beans, salt, pepper, and red pepper flakes. Winter squash soup with curry and coconut milk. This is the only butternut squash soup I love. The coconut milk negates the grainy texture that butternut soup can sometimes have, and the addition of the sour fish sauce and spicy sriracha balances the sweetness. Just a reminder that wheat toast with peanut butter, honey, and sea salt is a simple delight (especially on a snow day). Dan dan noodles and fish fragrant eggplant (both from Every Grain of Rice). These dan dan noodles are epic. Spicy, numbing, salty, with a nice richness from the sesame paste. Fish fragrant eggplant is the greatest use of eggplant’s absorbency and meaty texture. I forgot how long it takes to fry the eggplant before you stir fry it though. Definitely give yourself 30 minutes for that step. Pasta with spicy Italian sausage, peppers, and onions. This is a childhood favorite adapted from a pasta cookbook my mom had that had a recipe for every day of the year (maybe this one?). It was made with wagon wheel shaped pasta, so we always refer to it as “wagon wheels,” even when you make it with another shape pasta (as I did here, because wagon wheels proved hard to find). You saute about a pound of sausage then remove it from the pan. Add some olive oil to the fat and 2 Frenched onions (yes, it looks like a lot of onion). Saute until browned, and then remove from the pan. Add 2 sliced red bell peppers and saute until limp. Add a whole bunch of minced garlic (at least 3-4 cloves), a lot of salt and pepper, and 1 teaspoon red pepper flakes (more if you like). Saute for a minute or two until the garlic is fragrant and then add the onions and sausage back to the pan. Drain your pasta and add it to the pan, along with some extra olive oil if it seems dry. Winter vegetable chowder with crispy cabbage. There are so many things about this soup I love. It is simultaneously filling, but not heavy, and bright from the lemon and mustard. It has roasted cabbage on top which makes for a surprising topping. Blending part of the soup makes for a thick base without adding anything additional. If you were looking for the winter soup to break you out of a rut, this is it. Sauteed kale with bacon, white beans, and mushrooms over farro. This started out as a dish over polenta, but poor shopping made me reconfigure. I sauteed the 3 chopped slices of bacon, took it out of the pan once crisp, then sauteed the mushrooms. I added them to the bowl with the bacon, then sauteed the kale. When the kale was wilted, I added the bacon and mushrooms back in along with a couple cans of drained and rinsed cannellini beans. That went on top of farro, and was finished with a grating of parmesan cheese. It was quick and satisfying. Citrus Brussels sprouts slaw with rice paper bacon bits and almond parm. I didn’t go into this recipe expecting to never need bacon or parm again (and things haven’t changed). What I did end up with was a really interesting salad with a nice citrus dressing and crunchy, flavorful toppings. Absolutely worth a try when you need more plants in your life. I made it into a meal by adding some shredded cabbage, roasted cauliflower, and cooked farro. Parsnip latkes. The latkes themselves are pretty good, but the sauce that goes with these is the real star. It is bright and herby and just what I needed to use up some sour cream and dill in the fridge. Paella (from How To Cook Everything: The Basics). This is a bare bones version of paella, but the simplicity of ingredients makes for a meal that comes together much more quickly. I made it on a Sunday night, but I think you could squeeze it in on a weeknight in about an hour. I made it even less authentic because I used pedestrian paprika instead of smoked, but didn’t feel the dish suffered too much. Black bean and sweet potato tacos with cumin cabbage slaw and avocado. I prepped the black beans and sweet potatoes just like I do for burrito bowls. The slaw is just sliced cabbage, a sprinkling of salt and cumin seeds, and a squeeze of lime (adapted from The Homemade Kitchen). I ate the leftovers for lunch sans tortilla, just in a big pile and was just as delighted. White bean and tuna salad with caesar cabbage slaw. I had to go to an all day training and bring my own lunch. Since there was no microwave access taco leftovers were out, so I made a couple quick salads the night before to bring. Using cabbage with the caesar dressing makes for a salad that stays crunchy even when dressed the night before. I dumped the bean salad over the slaw when I was ready to eat and mixed them into a happy harmony. Baked potatoes with pan seared broccoli and cabbage, bacon bits, and cheddar cheese sauce. I started with the potatoes in the oven, then crisped up the bacon. I drained off most of the fat, but left a bit in the pan to sear the broccoli and cabbage while the potatoes finished cooking. I used essentially the same cheese sauce as I make for this mac and cheese, but used 8 oz of sharp cheddar instead of the bleu cheese. This is not a meal to make on the regular, but worth the indulgence every so often. Fish and chips with tartar sauce. Another indulgent meal (it is a birthday week in these parts). The amount of fish called for to feed 2 people is insane. I use 1 lb of fish for 3 servings which doesn’t make for any leftovers (which I don’t want anyways). I could have done with some more tartar sauce though. The batter is easy to make, sticks well, and is well seasoned (which is my complaint with most fish batters). A party meal! We hosted a birthday party and offered up a full spread. Charred onion dip, smoked salmon dip, cheese and crackers, buffalo cauliflower pizza, loaded potato bites, kale salad, banana cream pie donuts, and grapefruit cake. The potato bits, kale salad, and grapefruit cakes are all from The Smitten Kitchen Cookbook and I would highly recommend for a party or otherwise. Beef ragu and pinci (from Pasta by Hand). The last of the requested birthday meals. The ragu takes a whole afternoon (give yourself at least an hour to put together the sauce, then it simmers for 3 more), but is intensely tomato-y and beefy and wonderful. The pinci are one of the easier pastas I’ve made from this book, and really you are just rolling long tubes (with 2 farm employees in the house, we refer to them as worms). The full recipe makes a huge batch of sauce, but it freezes well. Mediterranean braised chicken (from How to Cook Everything: The Basics). It took me a little longer than Bittman to brown my chicken because I did it in 2 batches, but otherwise this was a simple meal. I made Alton’s rice pilaf (from I’m Just Here for the Food) and cabbage salad with anchovy dressing to go alongside for a nice Sunday dinner. 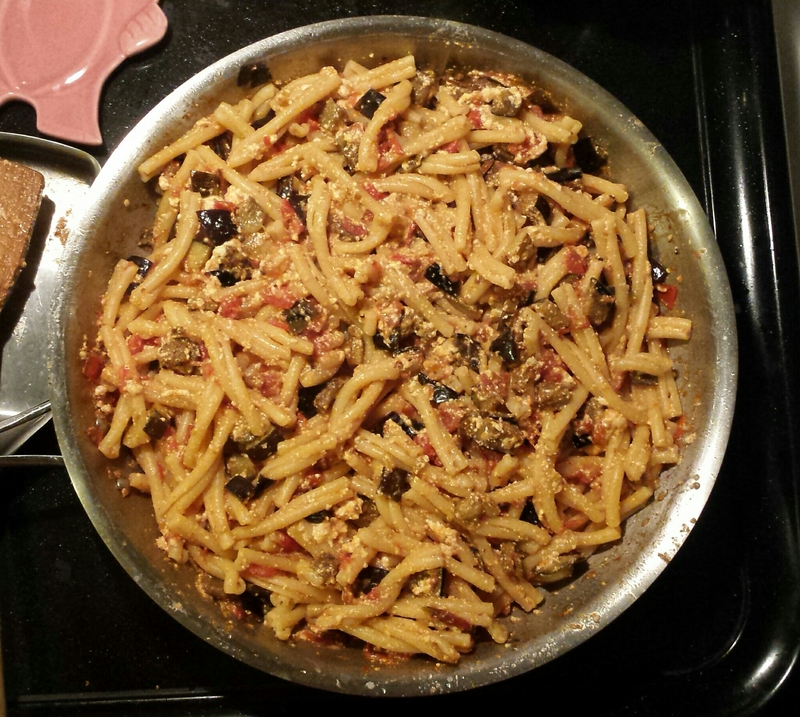 Along with the tomatoes, garlic, and onions, there were a couple anchovies melted in and olives as well. Next time I would chop up the olives so they flavor the whole sauce, but whole they did add nice flavor and were easily picked out by those who do not favor olives. Chickpea burgers (from How to Cook Everything: The Basics) with sweet potato fries (from Sprouted Kitchen). I made the mistake of not adding enough salt to my burger mix to start, so I kept adding and blending. This made the mix more uniform than Mark suggests, but the burgers still held together surprisingly well. Because mine were not as chunky they kind of mushed out of the buns as I ate it, but the flavor was great. I topped them with avocado, lettuce, red onion, and a 1:1 mix of sriracha and mayo. For the sweet potato fries I made a honey mustard dipping sauce (just honey and Dijon mustard, also 1:1). Mexican tortilla casserole. I’ve made this a few times before and it is like deconstructed enchiladas that take far less time to make. This time I left out the corn and spinach, and used spaghetti squash and kale. It is great with any vegetable and feeds a crowd. I was most proud of this meal. We finished all of the chicken from the braised chicken earlier in the week, but still had some tomato and rice leftover. The tomato sauce reminded me of shakshuka, so I reheated it in a frying pan and cracked a couple eggs into it. I covered the pan for about 5 minutes as it simmered away, added some crumbled feta at the end, and had it over rice. New dinner from an old one! Greek yogurt with pomegranate arils. I may like this even more than yogurt with pie. The pomegranate arils are juicy, tart bursts within the creamy yogurt. I don’t even like to add granola, because it muddles the perfect contrast. Of course it turned out that the meals I put the least effort into turned out the best. I barely planned the burritos and finished making them in record time and the whole dinner table swooned over them. The squash dish took far too much time and once I finally got everything cooked through I wasn’t that impressed with the result. Sometimes trying new recipes leads to learning great things….but other times it is at least nice to know I can make something good all on my own. Burritos with brown rice, roasted sweet potatoes, black beans, cumin cabbage slaw, salsa, avocado, and hot sauce. These were on the dinner table in an impressively short amount of time. I got home just before 7 and put the rice on. I preheated the oven, cut up the sweet potatoes into 1/2″ cubes, and dressed them with olive oil, salt, paprika, and cumin. They went into the oven for about 25 minutes, and in that time frame I sauteed a small onion and garlic, poured in 2 14-oz cans of black beans, and once they reached a bubble turned the heat down to simmer. Then I thinly sliced a quarter of a cabbage, then tossed it in the juice of half a lime, salt, and 1/2 a teaspoon of cumin seeds. In the last minutes I heated tortillas in the residual heat of the oven, and put out Greek yogurt, salsa, and hot sauce. Mushroom pizza with thyme. I used my usual pizza dough, then topped it with olive oil, sauteed mushrooms, dollops of ricotta, shredded mozzarella and fontina, and thyme. (This was a clean out the cheese drawer pizza, using leftovers from last week’s baked pasta.) I think mushrooms get the prize for most improved food when they go from raw to cooked. Sauteing them first in small batches is key to a flavorful pizza. The result is earthy, cheesy, and herby. Fried honey garlic delicata with white miso and crispy sriracha honey lime tofu over rice. This was a case of not following my food intuition and being worse off because of it. I was suspicious that the squash would fully cook in the pan….and it didn’t. I cut it about 1/2 an inch thick, cooked it at least 10 minutes per side, and still didn;t cook it all the way through. I ended up roasting all the pieces for 20 minutes at 400F after frying them, which easily make the process and hour or more. Then the sauce was far too sweet – I would have reversed the proportion of honey to soy sauce and added even more miso. I’ve made the tofu before and it was good, but next time I would not make it alongside another dish that needed frying. Bean and cheese quesadillas with cumin cabbage slaw, yogurt, salsa, avocado, and hot sauce. This was the meal I put the least planning into that pleased me the most. I used the leftover tortillas and beans from burritos, cheese from the freezer, and more of the same slaw I made for the burritos (adapted from The Homemade Kitchen). Just the beans and cheese went into the quesadillas, and everything else went on top like a big salad. Filling, with far more vegetables than you would expect with a quesadilla. Breakfast sandwiches with scrapple, tomato, kale, onions, egg, and aioli on everything bagels. This was the meal I actually put the least planning into because Will came home with all the ingredients and I made them into these sandwiches. It was my first time cooking and eating scrapple, a cornmeal, spice, and pork mixture, which came from our pork share. The texture was reminiscent of a banger, which usually has some oats or flour mixed in with the pork. Breakfast for dinner on Friday nights is a a great plan. My second meal with the scrapple was garlic toast, sauteed kale, a fried egg, and hot sauce. I think I liked it a bit better in this instance, but that may have been because I love garlic bread so much. This only happens a few times a year…but it is so glorious. Leftover pie with Greek yogurt for breakfast. Don’t knock it until you try it. 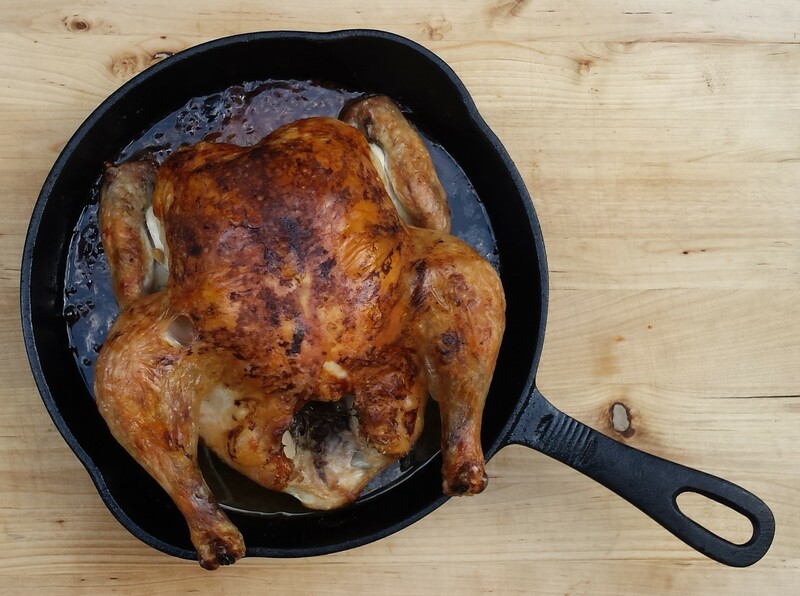 Before all meal ideas became turkey-centric, I made a few other noteworthy things this week. Spicy miso ramen express. I guess this was express because once it was actually time to eat, the ramen came together very quickly (and well, this was the first time I made ramen so I don’t have anything to compare it to). The most time consuming part was not actually part of this recipe, but I decided to make this smoked eggplant topping, which was a lot of work and then completely disappeared in the ramen. So as written this was a very flavorful soup that is definitely worth making again. Spinach and chickpeas. This dish was the center of a tapas inspired meal. It came together in half an hour, and went splendidly with salami, bleu cheese, sardines, and some red wine. Pizza with kale and coppa. I’m still working to recreate the best pizza I’ve ever had, which was at Delancy. It was a magic combination of kale and coppa. It is hard to recreate the quality of ingredients, and I’ll never get the wood-fired effect at home, but the flavor profile is getting there. I used the dough and drained crushed tomatoes from this recipe as the base, then used thinly sliced kale, shredded mozzarella, and coppa over the top. The coppa shrinks a lot when it cooks, so I overlap them to get almost full coverage. I think this time around the cheese was my weakest link, so next time I will experiment with other brands/types. Send the rice down beef and celery. This is my favorite recipe from Every Grain of Rice. It is quick and incredibly flavorful. I had half a head of cabbage languishing in the fridge, so I also made a simple cabbage dish with vinegar from the same book. Easy enough to pull off on a Friday without being overwhelmed, and then feeling super accomplished for also making dinner. Breakfast hash with kale and onion. Inspired by the Serious Eats home fries I’ve been making a lot of potato dishes recently with sauteed onions and whatever else I have around. This one ended up being a bit onion heavy, but a runny egg and hot sauce on top masks many flaws. Roasted sweet potato and black bean tacos. It was Halloween, and I didn’t have a full dinner plan so I went back to an old favorite. Halfway through cooking I realized I was making an orange and black dinner. As Will said, it was a “Halloween miracle!! !” and a new tradition was born. I made a quick cabbage topping by massaging some red cabbage with salt and cumin seeds (a riff on the taco topping recipe in The Homemade Kitchen). Also served with Greek yogurt, cilantro, jalapenos, salsa, and hot sauce. Roasted tofu rice bowls with miso tahini sauce (tofu roasting method from Thug Kitchen). Another favorite in these parts. For veg I used sauteed collards and cabbage, and shredded carrot which I left raw. I always double this sauce, because having too little sauce is the absolute worst. Dijon lentils with roasted cauliflower and potatoes (shown as I ate leftover for lunch and read Classic German Baking). I think I will have to update this recipe a bit…I used a whole head of cauliflower (2.5 lbs before I removed the stem) and that was perfect for 6 servings. (I still used 1 lb of potatoes and 2 cups of lentils.) I forgot I was out of whole grain mustard, so I just roasted the veg with oil, salt, and pepper. Bean and beer chili. Hearty, vegan chili for those nights you want something warming but not quite as heavy as this chili. Date, feta, and red cabbage salad. This salad is just about perfect. The ingredient list is short and the parts come together quickly (you don’t even make a dressing!). It is crunchy, salty, and a bit sweet, plus very pretty and pink. We’re in the process of moving, and as of this weekend are more in the new place than the old place. This has led to much more eating out then normal, and meals at home are mostly cobbled together with ingredients already on hand. We’re leaving behind a big l-shaped counter, with a convenient lazy Susan right below it that held all my oils and vinegars. But the kitchen in the old place was awkwardly located in the middle of the house with very little natural light and low ceilings. The new place has its own quirks, like the sink and the stove in different rooms (a weird feature of many apartments in this area), but it is awash in natural light and two (!) ovens. It’s still not quite at my dream of a house that is 70% kitchen, but it is a big step up. Sausages with peppers and onions on toast with mustard. I can’t entirely take credit for this meal, because my mom gave me all the ingredients for it. But it is a simple favorite that always satisfies. Tomato and sausage risotto. This risotto has been in my rotation for years. It doesn’t require broth (just tomatoes and water), stretches a small amount of meat to a meal for many, is an excuse to open a bottle of wine, and has a big pile of greens stirred in at the end. Pasta alla norma. The key here is to use enough oil to fry the eggplant in to get it really soft. The process itself is simple, and I finished off the tomato eggplant sauce with a large portion of ricotta cheese. It doesn’t melt into the sauce like mascarpone would, but it still tastes great. Bacon fat potatoes with kale and fried eggs. Essential this, but I cubed the potatoes and cooked them in a couple batches. There was a wild storm in our parts Friday night and it was just the night to have breakfast for dinner, crack open a growler, and pack up the kitchen with breaks to watch the lightning. Cinnamon toast with ricotta, honey, and sea salt. I wasn’t in the mood for eggs at breakfast much this week (who am I????? ), so this was a nice change of pace. This Friday the farm staff was invited over to one of our volunteer’s home for a Cowboy Cafe. This volunteer and her family regularly host these nights for friends where they cook entirely in cast iron over a fire. We had beans with bacon, onions, and garlic, stewed tomatoes and okra, grilled chicken breasts, blueberry streusel, steak, and salads. The food was incredible, and we had so much fun hanging around the fire while everything cooked. It made me want to cook everything in cast iron over a fire, but since that isn’t as easily achievable, at least come up with an easy party theme that I can execute reliably so entertaining is never a second thought. (Maybe meatballs?) While I didn’t help cook there, I still fit in a few other meals in this short week. Almost full Irish. It’s tough to find blood sausage around these parts, and I did use use streaky bacon in place of rashers…but otherwise this has all the important bits. Bangers, mushrooms and tomatoes (cooked in bacon fat), an egg, toast, and Worcestershire. Simply cooked ingredients that are fantastic in combination. Autumn vegetable soup with sausage and green lentils (from Flour, Too). This soup is not one you just throw together. There are a lot of ingredients, and they all need to be prepped and ready for the right time. I found myself pushing the soup pot off the burner a few times to give myself a bit more time to get the next step ready. All that work though, and it made for a great, flavorful soup. I loved all the spices (cumin, curry powder, fennel, smoked paprika, bay, oregano, turmeric, and cinnamon! ), the mix of vegetables, flavor from the sausage, and lentils. Worth the time, but next time I will make it on a Sunday. Roasted eggplant and za’atar pizza. I’ve been making this pizza for years, and it is always worth returning to. Two cookings makes for extra creamy eggplant, which always pairs well with tahini and feta. Scrambled eggs with goat cheese, along with sauteed kale and tomatoes, and toast. Getting in the last of the cherry tomatoes! Apartment hunting and a weekend with friends visiting made for delayed blogging! I feel as if I now finally have time to truly devote to cooking again, and of course my favorite produce is on its way out. At least there are still greens, squash, and apples to embrace! Spaghetti squash tacos with black beans. The first time I ate spaghetti squash was in these tacos. Ignore any notion you may have that spaghetti squash can only be used as a spaghetti replacement, and try these out. The squash shines in its own way with a punchy lime chili powder sauce. Sweet potato nachos with black beans. I don’t know if I would call these nachos…loaded fries seems more apt. Either way, it was an excuse to pile beans and cheese on fries and call it dinner. I didn’t have smoked cheddar on hand, so I used a shredded Mexican blend. Easy and gratifying. Pesto polenta with tomato and egg. I actually made this for dinner, with sauteed greens and garlic topped with an egg, and the leftover polenta became breakfast the next day with tomatoes instead. Tomato cheddar galette. This galette was GOOD. Incredibly flaky crust, a thin layer of mustard, a dense cheddar base, and sweet tomato slices. It was like a great tomato grilled cheese….but with more butter. We had it alongside an eggplant salad, and to bulk the meal up a bit for lunch I made hard boiled eggs. Vegetable soup with chickpeas and greens. This soup was entirely born out of the things in our fridge and a desire to clean out the freezer. I started the soup with a chopped onion, carrot, and pepper, and then added in 3 minced cloves of garlic. Then went in a couple quarts of stock, chickpeas, and a big pinch of salt. 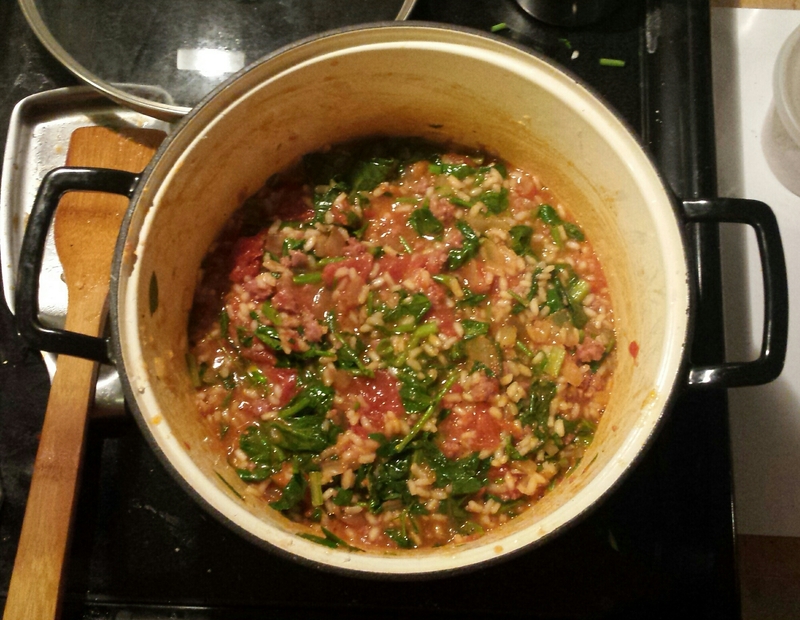 That simmered for a bit, then I added a huge bunch of chopped greens (kale, collards, and chard) until just wilted. Served with grated parm, a dollop of pesto, and toasted crusty bread. Fig, olive oil, and sea salt challah. I didn’t actually try this since it was a gift, but I’ve made it before and it was delightful. It comes together including baking in about 3 hours, the directions are incredibly easy to follow, and then you’ve made challah! I don’t have a stand mixer with a dough hook, so I start the dough in the food processor and run it until the motor starts to get annoyed. Spaghetti with vodka sauce. This barely counts as cooking because I took half a box of noodles out of the pantry, topped them with jarred vodka sauce that had been evicted from our freezer, and then finished with cheese. But you should know that I don’t always feel like cooking with much exertion. Apple Dutch baby. An impressive breakfast without all the fuss of flipping. I skipped the step of cleaning the pan, reheating it, and then putting the apples back in. I just poured the batter in and stuck the whole thing in the hot oven and everything was fine. A repeat breakfast recently has been toast, a swipe of Dijon mustard, fried tomatoes, and a fried egg. Toast with mayo, sliced tomatoes, salt, and pepper, and deviled eggs. A delayed arrival home after a weekend away (caused by a distracting book store stop…) made me rethink my more lengthy dinner plans. Tomatoes from the garden made toast awesome, and deviled eggs are always welcome. Zucchini feta pancakes and tomato salad. These were served at my friend’s awesome New Year’s brunch and it seemed like the perfect time to make them myself. Whipping the egg whites does make for a bit more work than your usual fritters, but it also makes these wonderfully light. I intended for these to be a light summer dinner, and it said they served 4-6…but that was definitely meant as a side. This served 3 for dinner and I would certainly make them again, just double for leftovers. Beer bean stuffed poblanos with green rice. The stuffed poblano recipe came from The Sprouted Kitchen. I love chile rellenos, but this riff makes for a much more wholesome and easier meal. The one thing I would change is omitting the cinnamon added to the beans which I found overwhelming. For the rice I made 2 cups of brown rice and roasted 3 ears of corn. I removed the kernels from the cooked corn and added them to the rice, along with a mixture of chopped cilantro, lime juice, olive oil, salt and pepper. Baked orzo with eggplant and mozzarella (pictured before the pasta cooks). While this does require turning on the oven, and a few cooking steps, it’s about as summery as you can get with a baked pasta dish. Eggplant, tomatoes, and mozzarella are virtually impossible to turn down together (at least for me), and I appreciate that you don’t have to cook the pasta beforehand. Breakfasts this week included yogurt with fresh picked raspberries, nectarines, and granola (pictured at top), plus burritos with beans (I cooked extra when I made the poblanos) with sauteed collards and scrambled eggs. Buffalo cauliflower salad. A perennial favorite. Cauliflower are starting to appear at farms in MA…get on it! Bacon bleu cheese burgers with fries and salad. This was for Will’s actual birthday. Simple, but it is one of his favorite meals and perhaps the one I make least often at home. I mix some minced bacon into the ground beef with some salt and pepper, then cook in the cast iron since we don’t have a grill. They were topped with bleu cheese and some leftover buffalo sauce from the previous night’s salad. For the fries I followed the recipe in My Paris Kitchen. The salad is a mix of cucumber, beets, carrots, and radishes sliced thin and tossed with mint, basil, vinegar, and olive oil. Falafel and pita. I was convinced that this would finally be the falafel recipe that I could fry without them disintegrating. Yet, I was wrong. As the first batch started to disappear in the pan I turned on the broiler and fished them out. Broiling wasn’t ideal, but it got them hot quickly. Dinner was saved, and they were still delicious with the first tomato from our garden (! ), lettuce, red onion, dilly beans, feta, and a lemon yogurt sauce. Zucchini carbonara. Thankfully I didn’t wait until September to make this, as last year I used the last zucchini of the season to fit it in. It remains my favorite carbonara recipe, even if frying the zucchini is time consuming (you could always speed it up with multiple pans). Couscous with lentils, tomato and cucumber salad, and yogurt sauce. Speed and ease were the goals with this meal. When we got back from a weekend away I threw on the fastest cooking grain and legume in the house on the stovetop. I picked up hothouse cucumbers and tomatoes at a farm on the way home, and chopped them up for a salad. I mixed the cooked couscous and lentils together with some olive oil and lemon juice, and the salad with some olive oil, salt and pepper. To top it all off I mixed some yogurt, tahini, lemon juice, and olive oil. 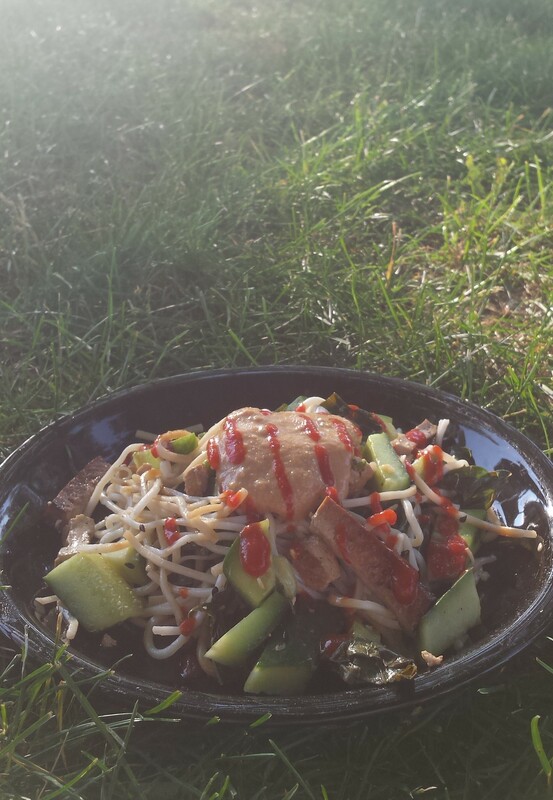 Cold noodles with peanut sauce, collards, and cucumbers. These were the first collards to come out of the garden this year!! I sauteed the collards, cooked some lo mein noodles and tossed them in some sesame oil, and when they both cooled tossed them together with some sliced cucumbers. I had some peanut sauce in the freezer (adapted from this recipe) to serve it all with, along with a big squirt of sriracha. I actually put this together after I made the couscous for Monday night’s dinner, and it was equally speedy and made for awesome picnic fare on Monday night. Burritos with black beans and tofu chorizo. I finally gave this tofu chorizo recipe a try, and was a bit disappointed. It was too dry, so next time I think I will add some diced tomatoes. The burritos altogether were good, with black beans, the tofu chorizo, sauteed collards, rice, salsa, and hot sauce, but I felt they needed some kind of sauce to bring it all together (I should have made green sauce). Fried rice with collards. In theory, this meal was a great idea. I made double the rice for the burritos so I could have leftovers for this dinner. Where I went wrong was in the rice storage. I should have let it cool completely before putting it away, and maybe left the container cracked in the fridge so it could dry out even further. A day later it was not dried out nearly enough, so my fried rice was a little soggier than it should be. Lesson learned. Chorizo breakfast tostadas with hash browns (photo by Jesse). This was my dream breakfast. We were visiting friends in Philly and on Friday their boss dropped off fresh tortillas and chorizo from his “chorizo guy” (New life goal: find a local chorizo and tortilla guy). Saturday morning we hit up a farmer’s market for potatoes, tomatoes, scallions, cilantro, and black raspberries (to fuel us while we cooked). I cooked the chorizo, parcooked the potatoes in water, and then crisped the potatoes in the pan so they could soak up all the chorizo fat (though next time to speed things up I think I will just toss them in the fat and roast them). My sous chef made a quick salsa with the cherry tomatoes, scallions, cilantro, jalapeno, salt, and pepper. Then I heated the tortillas in the pan, topped them each with an egg, flipped, and then topped with a little cheese when they came off the pan (similar to this recipe). 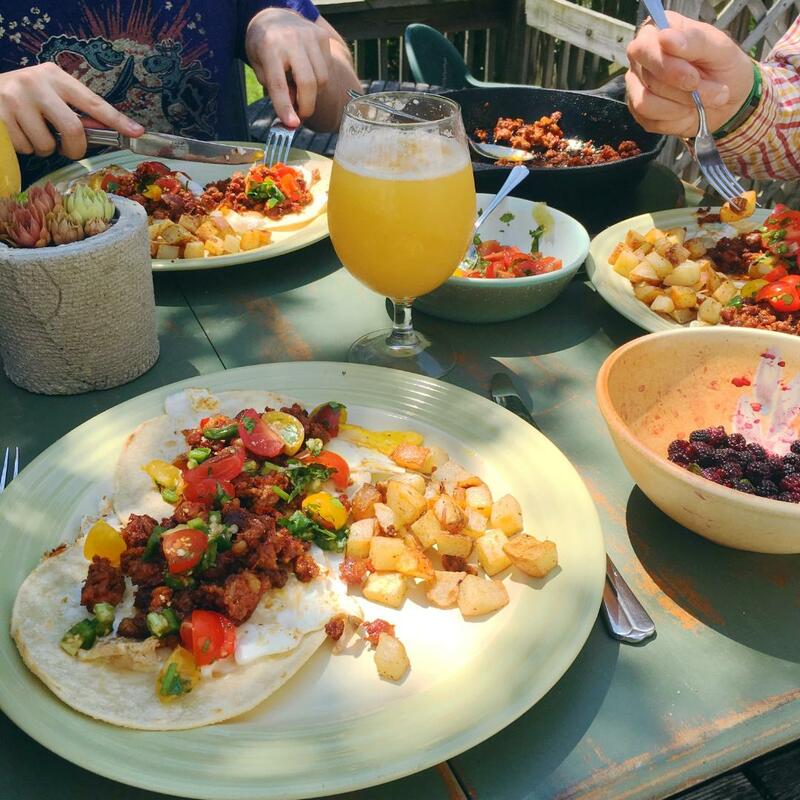 Eaten outside, with beermosas, for an epic brunch. I cook for two roommates, and most of the time if I ask what I should make for dinner the answer is “whatever you like!” But this week each had a special request and it was nice to have my dinner planning guided by others for a change. So this led to trying a new recipe (Korean tacos) and a riff on an old favorite (pesto pasta). 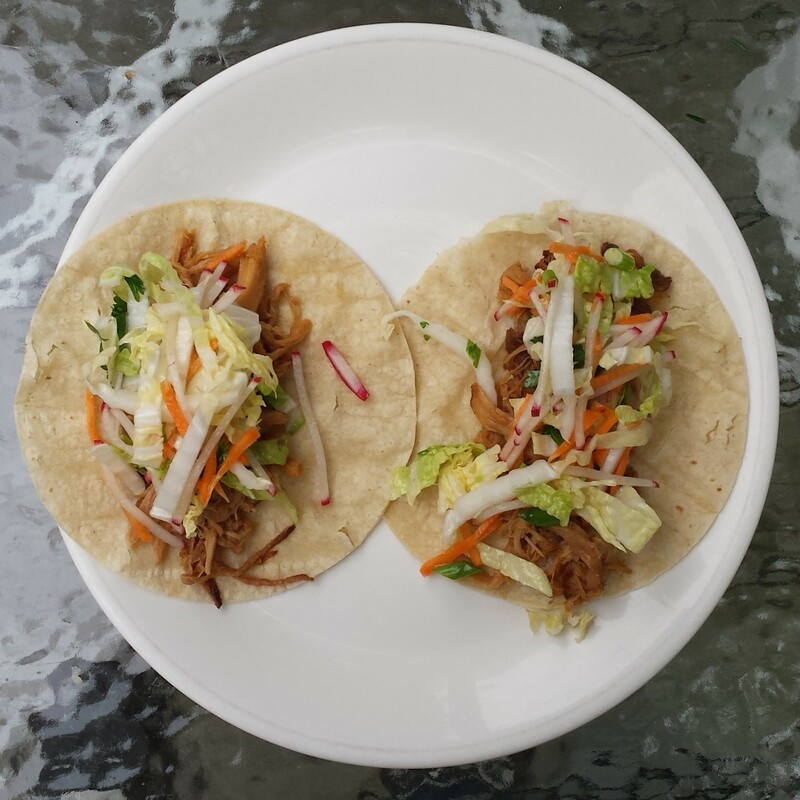 Slow cooker Korean tacos. This was a great dish because it took basically no thought and can feed a lot of people. I seared the pork and assembled the braising liquid the night before in the slow cooker pot, put it in the fridge, and then in the morning just slipped the whole thing in the slow cooker and turned it on. The pork was just mildly spicy and sweet, but just a bit on the dry side. The slaw was awesome, and made the whole thing into a real meal. I can see myself making the pork like this again just for the ease of it, but if I’m really trying to impress I’ll go a different route. 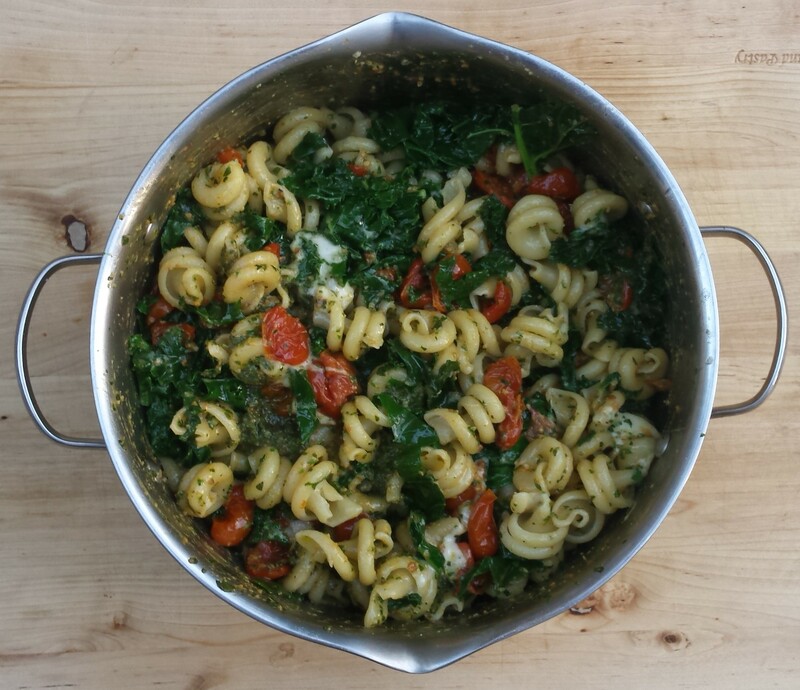 Pesto pasta with roasted cherry tomatoes and kale. Basil season is here!!!!!!!!!! I bought a giant handful from a farm stand along with the kale, but jumped a little ahead of the season to add the cherry tomatoes. I followed Alice Water’s pesto recipe from The Art of Simple Food. While I was making pesto and cooking pasta I roasted the halved cherry tomatoes at 350F for as long as it took me to do those things (probably about 30 minutes). When the pasta was cooked I reserved some cooking water and drained it. I put it back in the pot along with the kale and tossed it all to wilt. Then I added the pesto, a dash of the cooking water, the cherry tomatoes, and some cubed mozzarella cheese. We had a salad alongside with a balsamic vinaigrette and it tasted like summer. 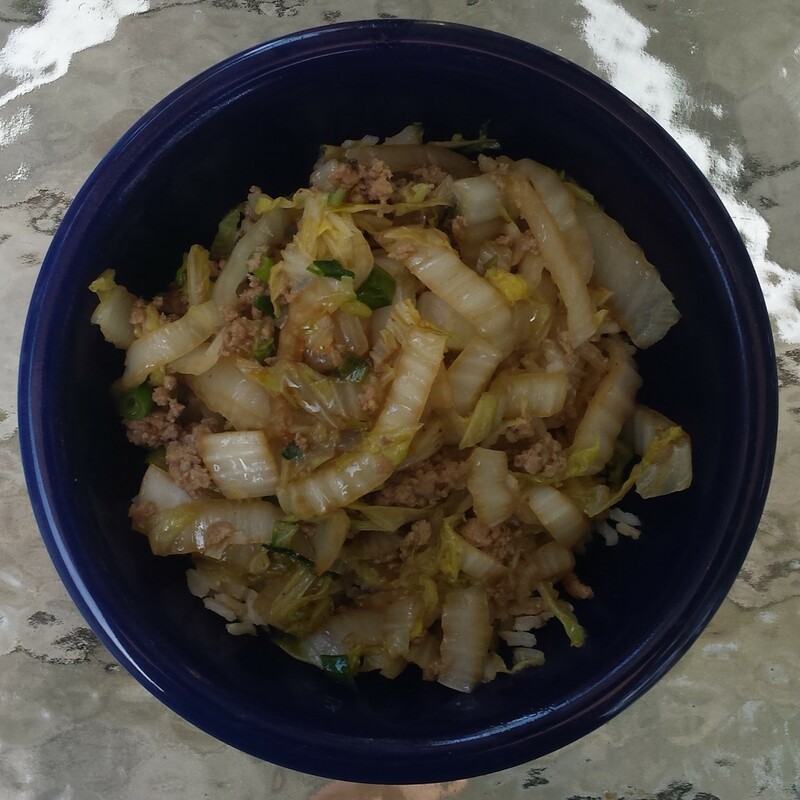 Sauteed pork and cabbage over rice. I’m on a mission to clear things out of the freezer, and had a vision that the ground pork should become dumplings. But 2 grocery stores were out of dumpling wrappers, and I just could not fit making my own into a Wednesday night, so instead dinner became dumpling filling over rice. I cooked the pork in the wok and then removed it and drained most of the fat (saved for future cooking!). Then I cooked the cabbage and finished with some soy sauce, sesame oil, shaoxing wine, and white pepper (inspired by this dumpling recipe). We ended up eating it with some chili garlic sauce on top, and I was so happy to have dinner done in under an hour. 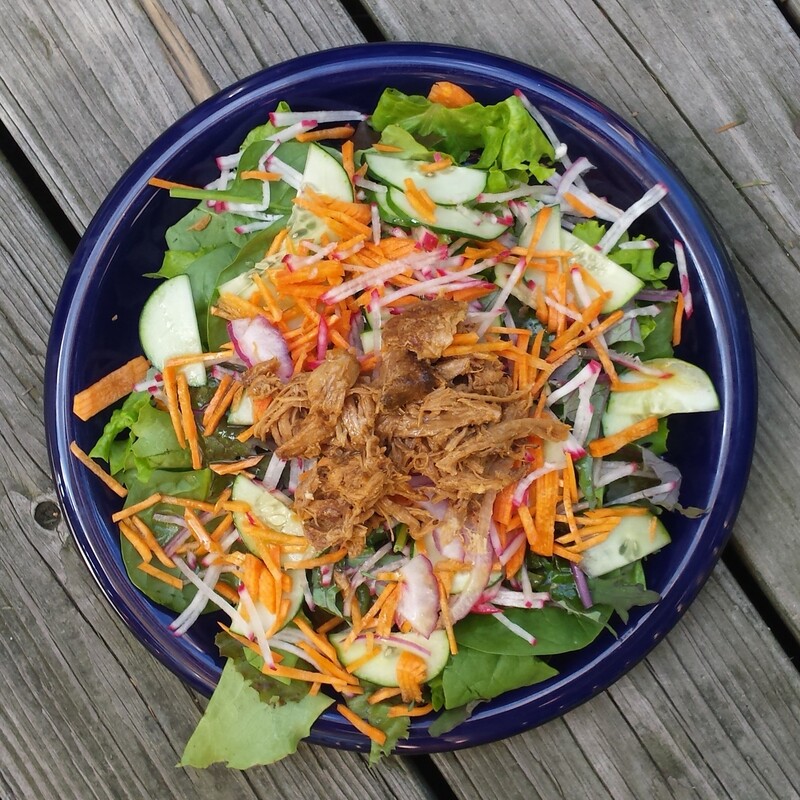 Big salads with cucumbers, radishes, carrots, and leftover pork (from the tacos). I made a simple sesame lime vinaigrette, and this was the perfect use for the rest of the pork on a hot night. Grilled spicy Italian sausages with peppers and onions. This will forever be my favorite grilled meal. It is the perfect thing to cook when you are away from your own kitchen and need to buy all the ingredients at the grocery store. Slice the onion into rounds and a bell pepper in half, throw everything on the grill, and then in the last few minutes toast the buns. Slather your bun with Dijon mustard and then go to town. 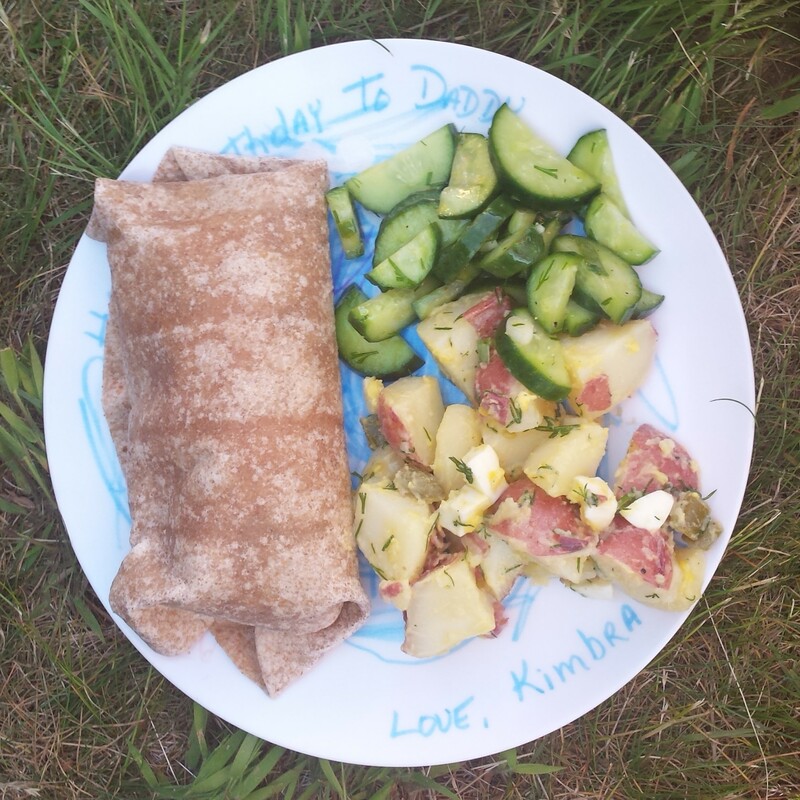 Mustard potato salad, cucumber salad, and wraps with hummus, turkey, sprouts, guac, tomato, and dilly beans. It is picnic season!!! I brought this to an outdoor concert and now I’m ready for all the picnics. The cucumber salad had scallions, dill, garlic, and a 1:1 dressing of white wine vinegar and olive oil. Obviously best eaten with your toes in the grass listening to some music. I can already feel seasonal produce anxiety starting to set in. I went strawberry picking with my roommate yesterday and we bought almost 8 pounds of strawberries. She made hand-pies, I made strawberry balsamic jam, and we still have two quarts leftover for general consumption. But I made the mistake of looking up my pinned strawberry recipes and found tens of options for tarts, ice creams, sorbets, pies, popsicles, salads and other sweets. More than I could ever reasonably make in strawberry season. 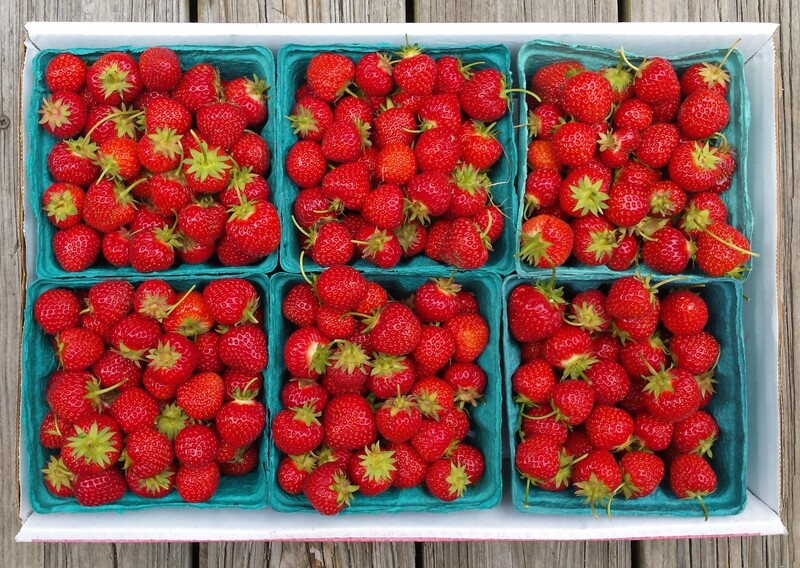 Plus strawberries are just a gateway berry for me – I love blueberries and the very best, raspberries, so much more. It’s time to pick a few recipes I’m most exited about, make them while the time is right, and then float on into the next fruit or veg in line. 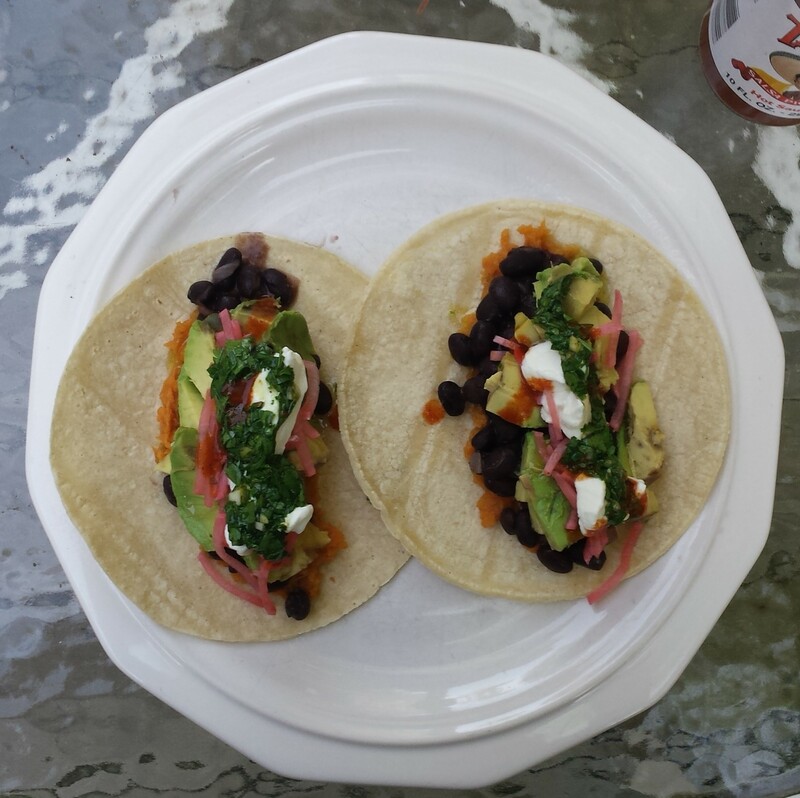 Tacos with mashed sweet potatoes, black beans, pickled radishes and cilantro sauce. These were born of things already in the fridge/freezer. When I made these baked sweet potatoes I ended up freezing an extra one. I defrosted it in the microwave, and then scraped out the flesh and composted the skin. I mixed some salt, cumin, and paprika into it and mashed it up. The black beans I cooked with some onion, and the shredded up the radishes and quick pickled them in some white wine vinegar. I chopped up half a cup of cilantro, then made it into a sauce with about a quarter cut of olive oil, salt, pepper, and a few cloves of chopped garlic. Roasted chicken and spring salad with new potatoes. I used my favorite basic roast chicken recipe from The Homemade Kitchen, and while it was in the oven I made the potato salad (sans snap peas, because there were none to be bought), and did some gardening. There is probably about 30 minutes total hands on time for this meal, which is just right for this time of year. 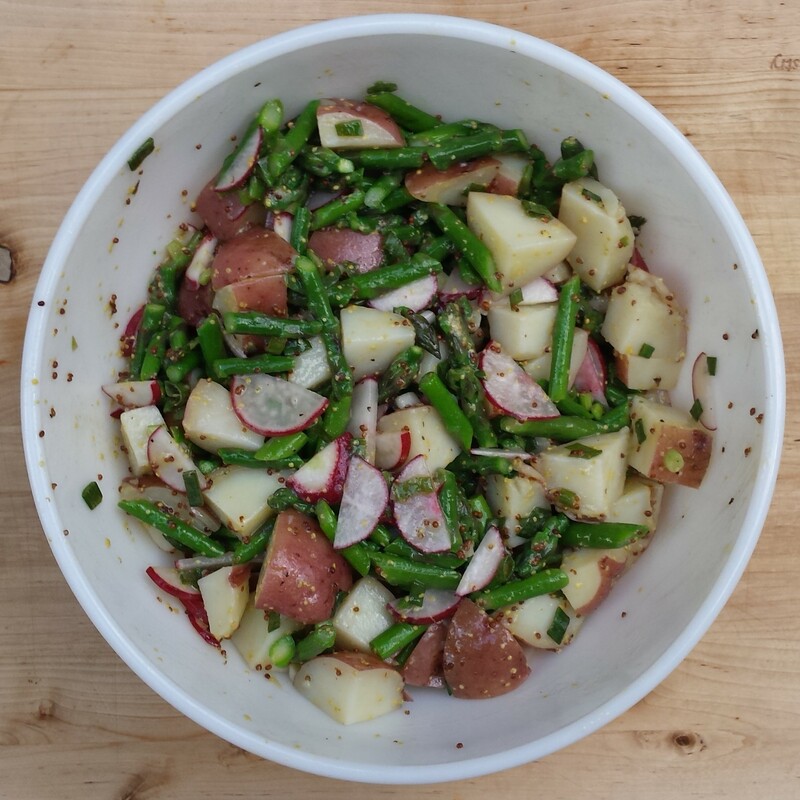 I love a mustard-y, vegetable forward potato salad and this is all of that. 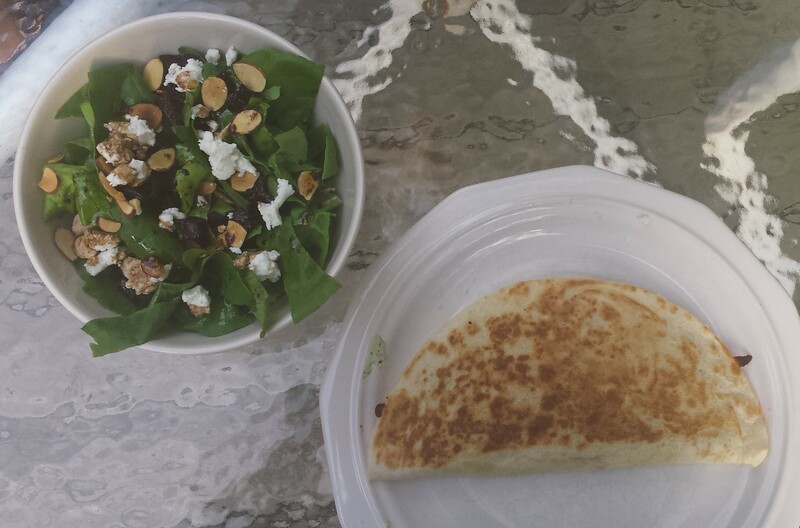 Strawberry and leek quesadillas and salad with roasted beets, toasted almonds, goat cheese and balsamic vinaigrette. These quesadillas might be the most springy dish of all time. My only complaint is that the strawberries make for a soggy dish, but it is still delightfully sweet and decadent with the goat cheese. Just don’t have as high of expectations for the leftovers. 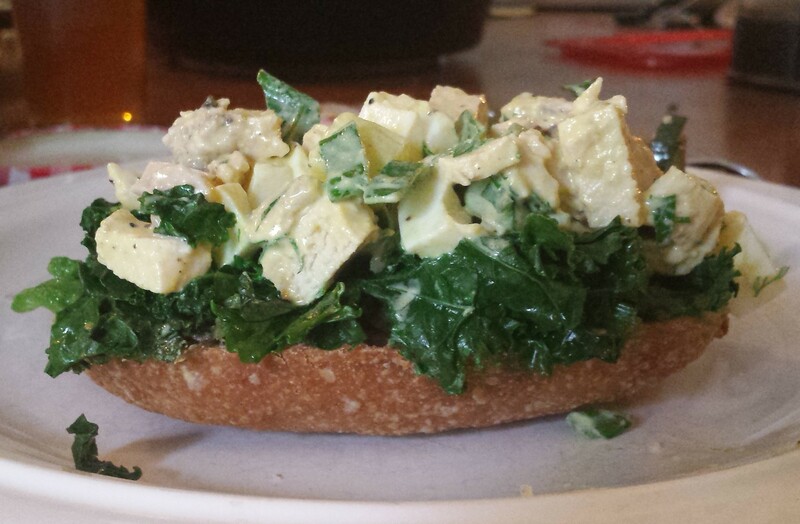 Chicken salad toasts with sauteed kale. I started this dish off thinking that I was following this recipe, but realized quickly that I didn’t actually read the recipe and I had a completely different recipe in mind. So using the rest of the roast chicken from earlier in the week, plus 3 hard boiled eggs to stretch it out, I made a dressing with 1 tablespoon mayo, 2 tablespoons Greek yogurt, 2 tablespoons white wine vinegar, 1 teaspoon horseradish, cucumber, chopped scallion, salt, and pepper. I served it with whole wheat toast, avocado, and sauteed kale. Lamb kebabs in fresh pita. These have been on my to-cook list for years. I made them into meatballs and broiled them because I don’t have a grill. They were heavily spiced and awesome with fresh pita, onions, cucumbers, herbs, and yogurt. Whipped yogurt cheesecake with roasted rhubarb. This is my ideal dessert, and not just because I already had everything to make it but the cookies. The whipped cheesecake took 15 minutes to put together the night before my sister came over for dinner. She brought some almond biscotti that I pulverized in the food processor as the rhubarb roasted. It was a light dessert, but an awesome combination of fluffy, creamy, tart, and sweet. As written the portions are pretty small. Four of us polished off all the yogurt cheesecake, and 3/4 of a pound of rhubarb (because I didn’t have a full pound on hand). 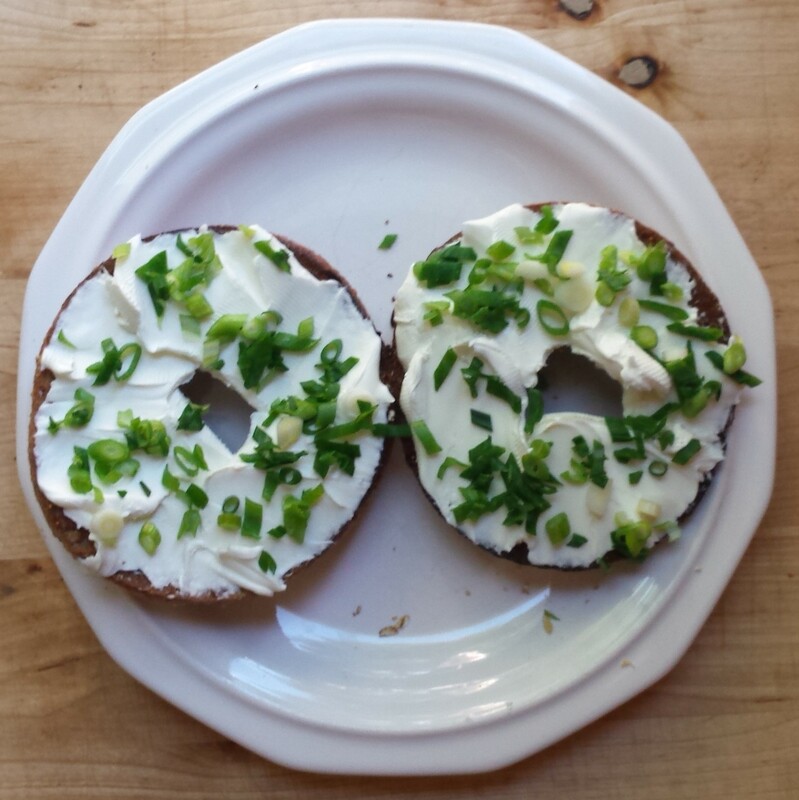 I froze some bagels leftover from a work event and then enjoyed them this week with butter, honey and salt, as breakfast sandwiches with chorizo and eggs, and classically with cream cheese and scallions.